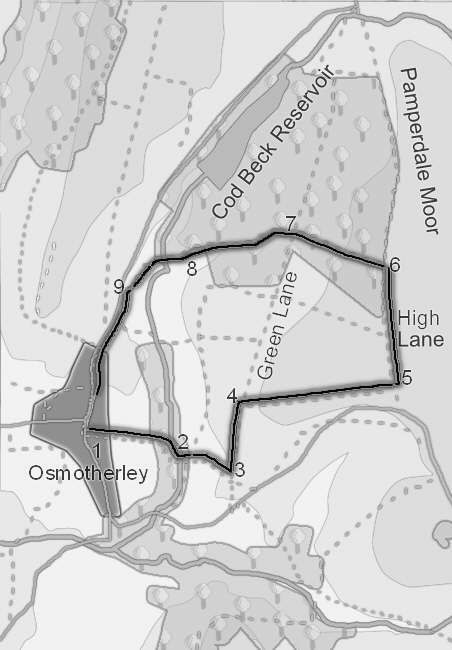 This walk takes you east of Osmotherley, to the edge of the open moors at High Lane, before returning to the village via the forests around Cod Beck Reservoir. In this three mile walk we see a good cross section of the moors - deep wooded valleys, open fields, heather moors, distant views and modern forestry. There is plenty of on-road parking in Osmotherley. Start at the centre of Osmotherley. On the eastern side of the market place, look for a passageway that leads through the line of buildings, signposted for the chapel. This passageway cuts through to another street. Cross that street, heading due east onto a footpath that heads out between houses into the fields. The footpath descends into the valley of the Cod Beck. Follow the path down, cross over the bridge, and continue straight on up the hillside opposite. Follow any diversions to the footpath as it passes a farm. As you climb, stop to admire the views behind you - on a clear day the Pennines are visible from here and there is a good view of Beacon Hill, north of Osmotherley. When the footpath reaches Green Lane (a muddy track in December), turn left onto the lane and follow it as it climbs up the hill. Just as the lane begins to level out, a clearly signposted footpath leaves to the right. Take that path as it climbs over a spur of the moors. This section has great views down into Oak Dale and across the valley towards Black Hambleton. Be warns that the path here crossed some fields that were particularly muddy early December! After half a mile, the path reaches High Lane. At this point it is a tarmac lane, running between the fields. Turn left to head north along the lane. There are great views ahead of Whorlton Moors, and across the open moors to the right. High Lane soon comes up to the side of the forest above Cod Beck Reservoir. Look for a gate into the forest, signposted for a footpath. Take the forest path downhill between the trees. Just after you enter the woods, you will find a spring in the trees. The path here can be quite wet, as it runs very close to the stream that comes from the spring..
Amongst the trees you will find remnants of the farms that were here before the woods. Continue straight on past the ruined houses, keeping them to your right. The lane from the Youth Hostel joins the road running north from Osmotherley. Turn left onto this road, and head back into the village. .